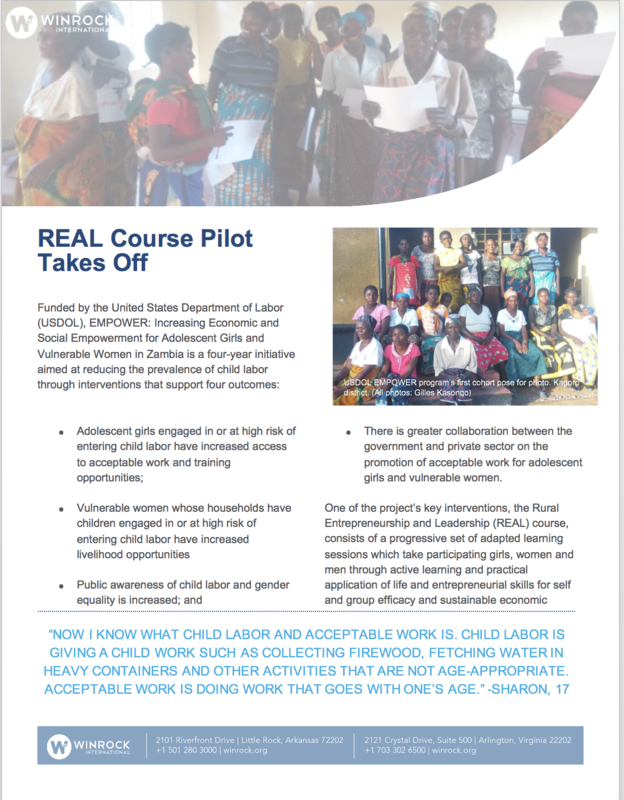 The United States Department of Labor’s (USDOL) funded project EMPOWER: Increasing Economic and Social Empowerment for Adolescent Girls and Vulnerable Women in Zambia is a four-year initiative aimed at reducing the prevalence of child labor through interventions that support four outcomes: adolescent girls engaged in or at high risk of entering child labor have increased access to acceptable work and training opportunities; vulnerable women whose households have children engaged in or at high risk of entering child labor have increased livelihood opportunities; public awareness of child labor and gender equality is increased; and there is greater collaboration between the government and private sector on the promotion of acceptable work for adolescent girls and vulnerable women. One of the project’s key interventions is the REAL (Rural Entrepreneurship and Leadership) course consisting of a progressive set of adapted learning sessions which take the EMPOWER participating girls, women and men through active learning and practical application of life and entrepreneurial skills for self and group efficacy and sustainable economic activities aimed at preventing child labor. Over the life of the project, EMPOWER will train 2,500 girls, 1,500 women and 1,000 men in the course.